Can you believe it is already August?! The days are long and it is HOT. Summer is in full swing, and I have no desire for it to leave just yet! I feel like I'm just getting into the swing of my summer-mode. Anyone else feel the same way? I am definitely not ready to start back to school in the next couple weeks. But for now I'm not going to think about all the craziness that is about to start, and just enjoy the relaxation and ease of these summer days. While I'm doing just that, you can guarantee that I will be enjoying this beet carpaccio as an light appetizer or refreshing side. This simple recipe is a vegetarian take on the classic carpaccio. A carpaccio by definition is a thinly sliced raw meat or fish, typically beef or tuna, that is accompanied by a vinaigrette or sauce and served as an appetizer. This recipe takes this concept and puts a veggie spin on it by using beets in place of the raw meat. The beets are roasted in the oven to develop their sweetness and soft, "meaty" texture. Once sliced, the beets soak in a bath of balsamic vinegar. The tart acidic flavor is the perfect balance to the earthiness that still lingers in the roasted beets. To serve, place the beets in a single layer on a platter to mimic a classic carpaccio. Then, finish it off with a handful of arugula, salt, pepper and drizzle of olive oil sweetened with brown rice syrup or honey. This appetizer makes quite a statement, yet it is so simple! The natural color of the beets is absolutely stunning. I love how the fuchsia color bleeds from the beets, leaving its mark on the flatware while contrasting with the green arugula and white feta. The tart balsamic cuts the earthiness of the beets, yet blends together nicely with their natural sweetness. However, it is the sweetened olive oil really makes this dish. The light flavor of the extra virgin olive oil is tainted with the slightest hint of sweetness that makes this appetizer irresistible. 1 cup of sliced beets have about 60 kcals, 0 g of fat and 2 g of protein. They're rich in vitamins, minerals and antioxidants. Beets are an excellent source of folate with 1 cup providing 37% of the RDA. Folates are use for DNA synthesis, thus is critical for pregnant women and their children to avoid neural tube defects. Beets are also a good source of B-vitamins and minerals such as iron, manganese, copper, and magnesium. The unique fuchsia color of red beet is due to betalain pigments, such as betanin and betacyanin. These phytochemicals are not only eye-catching but play an important role in cardiovascular health. The phytochemical glycine betaine has been found to lower homocysteine levels in the blood. Homocysteine is one of the toxic metabolites our body creates. It promotes platelet clotting as well as atherosclerotic-plaque formation. High levels of homocysteine in the blood can result in cardio vascular disease, stroke and other vascular diseases. Beets also are an excellent source of nitrates that improve blood flow throughout the body. These nitrates increase the amount of nitric oxide in our blood vessels which signal dilation of the vessels, more blood flow and oxygen, and therefore lower blood pressure. Through this same pathway, new research is finding that beets can help the body respond better to exercise by balancing oxygen and increasing stamina! Fascinating, huh?? Now on to the recipe. This appetizer was inspired and adapted from the Deliciously Ella's cookbook. If you have not gotten a chance to get your hands on a copy, YOU MUST! It's such a good reference for nourishing vegan recipes. I love it. A vibrant vegetarian take on the classic carpaccio with balsamic and sweetened olive oil drizzle. Remove beet stems and greens, then gently rinse the beets to remove any remaining dirt. Wrap the beets all together in a double layer of foil. I spread the foil down on the counter, place the beets in the center and fold up the sides of the foil so it covers the beets. Place the beets on the center rack for 1 hours, then take them out and let cool inside the foil. Once cool enough to handle, take the beets out of the foil and simply peel off the skin. It should slide right off with your fingers, otherwise, you can use a paring knife. Once the skins are removed, cut the beets into slices as thin as possible or use a mandolin. Cover the sliced beets with balsamic vinegar and let sit for 10 minutes. While the beets sit, place the olive oil and brown rice syrup in a small bowl and mix well. 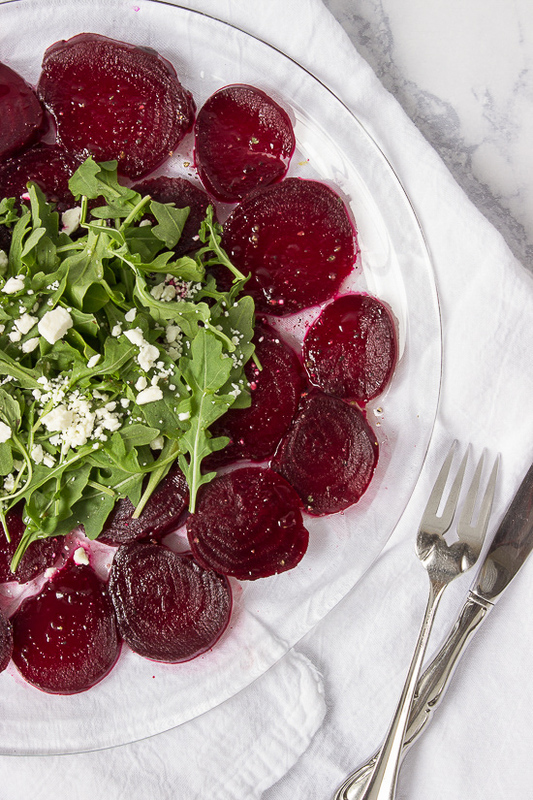 To serve, place the beets flat on a platter, add the arugula and feta to the center of the plate, top with salt, pepper and finish with a drizzle of the sweetened olive oil.